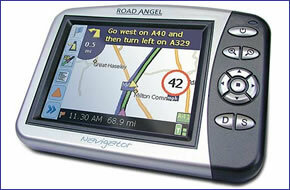 The Road Angel Navigator is a GPS speed camera location device and a portable satellite navigation system. The Road Angel Navigator is the world's first integrated speed camera locator and full feature, colour, touch-screen satellite navigation system. Road Angel Navigator has been discontinued. The Road Angel Navigator satellite navigation combines the award-winning speed camera and accident blackspot warnings of the market-leading Road Angel, with full colour touch-screen Road Angel navigation. The Road Angel satellite navigation system combines clear turn-by-turn voice guidance with full colour touch-screen technology and 3D GPS navigation street-level mapping. It will quickly calculate your desired route, then automatically recalculate should you make a detour. ‣GPS navigation system features built-in charger. The Road Angel Global Positioning System comes with a suction cup bracket for easy installation.